I have so many good associations with pears. When I was a child I was entranced by the pear-in-the-bottle liqueur my father had. 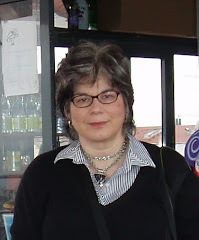 As an adult I learned to make all sorts of baked and poached pear recipes and served the cooked pears by themselves, with chocolate, berry or caramel topping, or even as part of a lush almond tart filling. One memorable menu del dia in Spain that concluded with Pears Helene sealed my affection for using this fruit as a dessert. 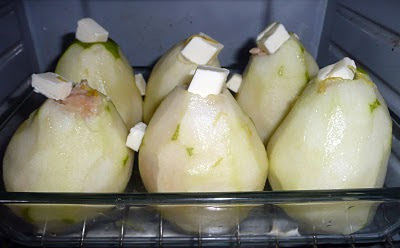 But I think I find found my ultimate pear recipe (at least for now) -- Oven Poached Pears with Almond Filling. The pears are sublime and with each bite you get the sweet jolt of almond. Yum. The cooked pears are wonderful napped with some rich chocolate, berry or caramel (particularly a dulce de leche) sauce, either homemade or not. You can also add a small scoop of vanilla or other ice cream or a dollop of whipped cream. I find this cooked fruit recipe very forgiving. You can vary the type of pears (I've used Bosc, Bartlett and D'Anjou pears) and use pears that are not yet ripe (in fact I think slightly under ripe pears work better) or even border on the hard and still come out sweet and luscious. The process is made easier if you have a good vegetable peeler and an apple corer, although a paring knife will work, too. I prefer this dish unsweetened. If you suspect your pears might not be naturally sweet or you like things a bit sweeter, you may want to sprinkle a little sugar over the pears before baking. Preheat oven to 350 degrees. Mix 1/2 cup of lemon juice with the water. Cut a slice off the bottom of each pear if needed to help it stand upright. Peel and core pears, not cutting all the way through to the base, leaving a 1/2 inch "plug" at the bottom so that the hole from the core does not go all the way through. After each pear is prepared dip into the lemon juice mixture until covered. Set into a glass or other baking dish that can snugly fit all 6 pears. (Discard the lemon water mixture after all the pears have been dipped.) Shape the almond paste into 6 cylinders about the size of the cored hole and fill each pear. Drizzle with the juice of one lemon, scatter lemon zest on top and dot top with butter bits. Cover top of baking dish with foil, place in oven, and baste the pears with the cooking liquid periodically. Bake for 35-50 minutes (depending on kind of pears and how ripe they are), until pears are cooked through and can be easily pierced with the tines of a fork. Serve hot, warm or at room temperature, spooning cooking syrup over pears. If desired serve with topping(s).